Come and experience the journey while we invite Spirit in to shift our consciousness around money and prosperity. As many of you know, the world is going through evolutionary leaps and bounds, and one thing it cannot contain from the past any longer, is a consciousness around greed, taking from others, or gain at the expense of other. We have so much to learn about the unlimited abundance of the Universe. But the one place we need to start is within ourselves, and begin to look at our beliefs, and our results in the area of prosperity and abundance in our lives. Are you feeling stuck in area of money? Is there constant worry in your life about what will be coming in next, what bills need to be paid, or if your current investments are going to be worth anything in the near future. All of that can be let go. But it's not until we understand that we are always provided for, at all times. It is when we know and truly 'get' that we are unlimited ourselves, that true prosperity can flow into our lives. "To give and to receive are one in Truth"
Although it has taken me many years to practice and study the truths in A Course in Miracles, the teachings repeatedly call to "extend a Holy Instant to your brother". What this means is that in a single instant, Light can enter and transform, put 'into correction' all that has fallen out of perfection. It is through this process that you will be receiving more Light through this program. "And what is light except the resolution, born of peace, of all your conflicts and mistaken thoughts into one concept which is wholly true? 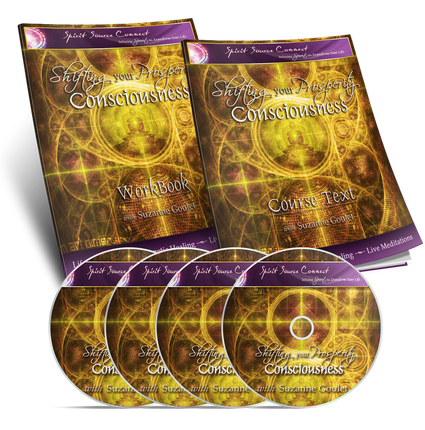 You will receive immediate access to all your digital files for week One, including 5 audio tracks, a transcript of the meditation and a workbook. Each week you will receive the subsequent audio files, until your course is complete in four weeks. Please allow one week for shipping and handling of your physical product. 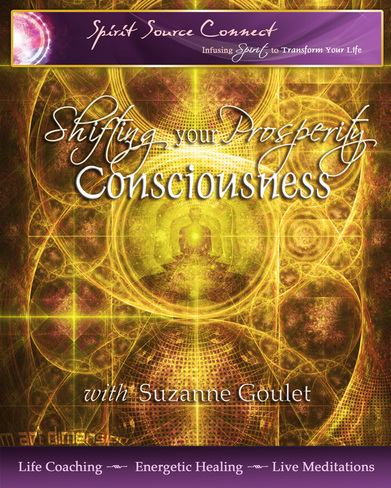 With your purchase of "Shifting Your Prosperity Consciousness", you will once again gain the freedom you need to be liberated from unconscious blocks. Whether you have succeeded in the past or not, your wealth and prosperity are based on two conditions: that your consciousness is cleared enough, and that you are willing to receive the Energies from Source that are your Divine right. 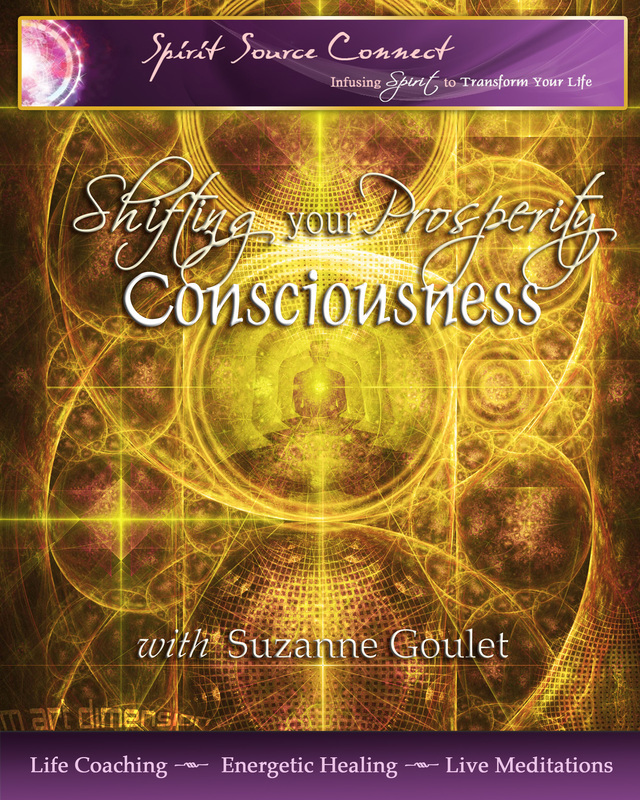 Suzanne Goulet is a conduit for the healing energies of Spirit. Acting as a guide, she will inform you of what is being received, and create the profound experience of transmuting energetic blocks that exist in your consciousness. She has been a clairaudient empath since childhood, and now holds A Course in Miracles as her guiding force throughout her life and in the energies she transfers for others. "What happened over the next 20 minutes or so is out of my experience, but I´d say I was being reprogrammed at a cellular or DNA level…..lots of warmth, tingling, swooshing, connection. It was real, not dreaming, I was very awake. It is difficult to describe the sensations as they were very SUPER NATURAL, nothing I have ever experienced on this planet, but it felt good. The words ¨I am having a super natural experience¨ kept coming to me, it was out of this world for sure." Suzanne went quickly and powerfully to the point of my issues. It ended with a guided meditation that has caused what feels like a permanent shift in my consciousness. I am thrilled and amazed at this unexpected result. This was just a preliminary session! I can hardly imagine what might come next. 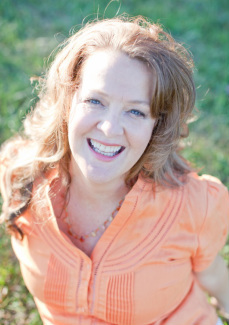 Suzanne possesses a true gift for connecting with people. She is genuine and cares deeply about helping people to live an enlightened, loving, happy life. Thank you Suzanne for all the precious kind, caring support you have given me on my journey to a higher level! "Your downloads have been a tremendous inspiration to me and a reminder of the fact that I am loved, protected and provided for. It has made me even more sure of my path as a healer. And I have felt enveloped by healing energies through your downloads. That is why I love them so much. They are also giving me the courage to take the first steps in setting up my practice - I pray that I am guided along my path.